Asteroid impacts may have helped make Mars a more life-friendly place — and not just by delivering water and the carbon-based building blocks of life as we know it to the Red Planet. Incoming space rocks may also have helped seed Mars with biologically usable forms of nitrogen long ago, if the planet's atmosphere were rich in hydrogen (H2) back then, a new study reports. A portion of the experimental setup researchers used to simulate asteroid impacts in the early Martian atmosphere. The flask contains a composition of carbon dioxide, nitrogen and hydrogen gases. A high-intensity infrared laser is focused into the flask from a lens (left), to simulate the high-energy shockwaves produced by asteroids entering the Martian air. The gas is then evacuated from the flask and analyzed to determine the composition and levels of nitrogen fixation. 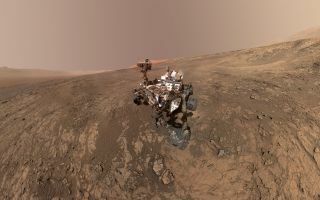 Scientists aren't sure where the Gale Crater nitrate came from — and that's where the new study comes in. A team of researchers simulated the early Martian atmosphere by filling flasks with various mixtures of hydrogen, nitrogen and carbon dioxide gases. The scientists blasted the flasks with pulses of infrared light, to mimic the shockwaves created by asteroids plowing into the Red Planet's air, and then measured how much nitrate was formed. "The big surprise was that the yield of nitrate increased when hydrogen was included in the laser-shocked experiments that simulated asteroid impacts," study leader Rafael Navarro-González, of the Institute of Nuclear Sciences of the National Autonomous University of Mexico, said in a statement. "This was counterintuitive, as hydrogen leads to an oxygen-deficient environment while the formation of nitrate requires oxygen," he added. "However, the presence of hydrogen led to a faster cooling of the shock-heated gas, trapping nitric oxide, the precursor of nitrate, at elevated temperatures where its yield was higher." Mars' current atmosphere is just 1 percent as thick as that of Earth. But the Red Planet's air was much thicker about 4 billion years ago, and ancient Mars featured oceans and long-lived lake-and-stream systems as a result. The composition of that long-lost atmosphere is not well understood. But some modeling work suggests that H2 may have been present in substantial amounts, helping keep the Red Planet warm enough to support all that liquid water. "Having more hydrogen as a greenhouse gas in the atmosphere is interesting both for the sake of the climate history of Mars and for habitability," study co-author Jennifer Stern, a planetary geochemist at NASA's Goddard Space Flight Center in Greenbelt, Maryland, said in the same statement. "If you have a link between two things that are good for habitability­ — a potentially warmer climate with liquid water on the surface and an increase in the production of nitrates, which are necessary for life — it's very exciting," she added. "The results of this study suggest that these two things, which are important for life, fit together and one enhances the presence of the other." The study was published in January in the Journal of Geophysical Research: Planets.